Here continue our findings on the ergonomic qualities of the binoculars in the study. The diopter adjustment mechanism is a focus knob that lets you focus one side of the binocular separately from the other, in order to set the binocular to accommodate differences in the focusing of your two eyes. When you acquire a new binocular, you immediately set the diopter adjustment for your own eyes. If the setting holds, and no one goes and changes it, you can forget about it. If you share your binocular with others, each user needs to set the diopter personally, each time the binocular changes hands. The correct diopter adjustment is essential to a focused image. Even though a birder with non-shared use of a binocular might need to use the diopter adjustment only once, or only rarely, it's important to be able to set it easily. You should be able to turn the diopter knob without straining your fingers or scrinching up your eye with the effort. Ideally, a diopter adjustment should lock, so that it can't be accidentally moved from its setting. It should have markings or detents to facilitate putting it back to its normal setting if it does get changed. And the setting should be easy to read, so that you can confirm at a glance that it's still adjusted correctly. This Minox HG is a good example. You unlock the diopter adjustment wheel by pullling up on the metal ring. You set the diopter adjustment by turning the ring (for example, 1-1/2 marks, as shown in the photo). And then you lock the setting by pushing the ring back down again. Click. Very nice. We found considerable range in diopter adjustment style and quality among our mid-priced binoculars. We found lockable diopter adjustments superior to diopters that hold their setting merely by friction, but only 13 of 56 the mid-priced binoculars in our study offer the locking feature. Those binoculars with lockable diopter adjustments employ a variety of ingenious devices. The Leica Ultravid Compact was our favorite. The regular focus knob is also the diopter adjustment knob. When you push a button under the bridge, the focus knob changes function and focuses only the right eyepiece, allowing you to set the diopter. When you release the button, the focus knob again focuses both eyepieces. At any time, you can read the setting on the focus knob, reassuring you that it is correct or alerting you that it needs adjusting. Other notable examples of locking diopter adjustment mechanisms are the Bushnell Elite2 and Bushnell Infinity, Leupold Cascade, Pentax DCF ED (shown at right) and Pentax DCF SP, Swift Audubon, Vortex Razor, and Vortex Viper. 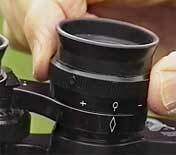 The diopter adjustment is a control knob on your binocular. It is designed to let you compensate for differences between your own two eyes. Once you set the diopter, then the two barrels should stay in proper relation. From then on you can focus just by turning the central focusing knob. If the diopter adjustment accidentally gets turned from the right setting, it can make the binocular unusable, as the two eyes can never focus at the same distance at the same time. Here's a quick course in setting your binocular's diopter adjustment to work with your own eyes.